A Diamond Select Toys release! How deep is your Gallery? 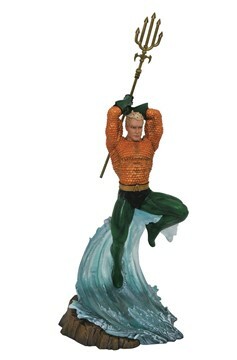 The DC Gallery line of PVC dioramas now adds the King of Atlantis, Aquaman! Springing from the sea with his trident poised to attack, Arthur Curry is the subject of this 9-inch-scale diorama, wearing his classic orange-and-green outfit. Made of a high-quality plastic, and featuring a detailed sculpt and exacting paint applications, it comes packaged in a full-color window box. Hand-sculpted by Jean St. Jean!.